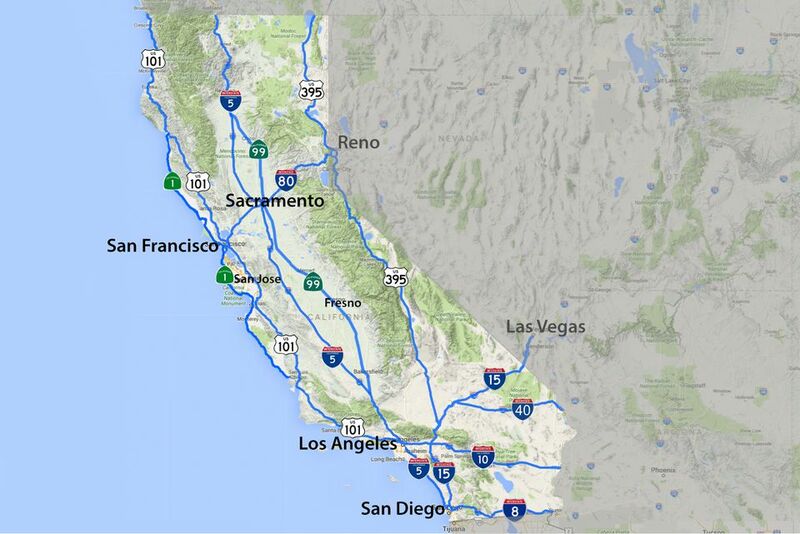 This is a simple California road map that gives an overview of the highway system, with the most commonly used routes highlighted. It can't give you driving directions or distances, but it's an easy way to get a better idea of what's where and how to travel between the major cities. If you want to see a little more detail, use this link to see it in a larger size. A simple highway map won't tell you whether a road is closed. In California, road closures happen for construction, but you also need to look out for winter snow closures and road that might close during winter rains because of mudslides. Once in a while, a big forest fire might force a road closure, too. Apps can help. They'll show you where traffic is slow or stopped, but they give no hints if the highway is just plain closed. The easiest way to find out about closures is to check the Cal Trans website for road closures. All you have to do is enter the highway number and you'll get information about temporary closures and road work. Their site can also help you find out whether roads through the mountain passes are closed by snow and whether there's been a highway-closing landslide along the coast. CalTrans has a mobile Quick App, but I think their website is more helpful if you need to know about big road closures. Other traffic apps can show you that traffic is slow or have odd gaps that might indicate a closure, but they aren't as easy to spot. If you're visiting California and don't know the rules, I like this California Driving Survival Guide. It has a summary of the laws you need to know, what Californians mean when they say "what's up?" or "literally" and what you need to know about Californians' bad driving habits. If you're looking for more than just driving information, try these guides for getting from place to place in California - by air, train, bus, and driving. They're the result of hours of research that we did so you don't have to. You might also need to know How to Get Around the Disneyland Resort or find out How to Get Around Lake Tahoe. In San Diego, learn how you can get around using the San Diego Trolley. If you need more California maps, check this index of state maps. To understand all of California's regions and where they are located, consult the Map of California by Region, which also includes a list of California Places by Area. If you're planning a trip to the mountains in the winter, you'll also need to know When You Need Snow Chains to Drive in California. You may also need to know how to get around the major tourist areas in California. If you're going to LA, you definitely need to read this guide to getting around LA, local traffic lingo and other transit tips. If San Francisco's puzzling mix of buses, trolleys, cable cars and other transport has you scratching your head, use this Guide to Getting Around San Francisco to sort it all out.